*I’m proud to partner with CVS Pharmacy on this Healthy Afternoon Snack Ideas post for the CVS healthy foods line. All opinions expressed are my own, and all product claims or program details shared should be verified at CVS.com or with the appropriate manufacturers. Let’s talk about afternoon snack cravings, shall we? If you’re anything like me, riiiiight around 3pm (which is that awkward, not lunch, not quite dinner and juuust before I go to the gym timeframe), you find yourself in one of those annoyingly snacky moods. It’s like the pantry doors open up and start whispering to me “heyyyyy, girl…you know, you want something in here…” and pretty much every damn day, I succumb to that made up voice and find myself standing in front of those bifold doors and figuring out the best bang for the macro buck in my head as I sort through snack options. Before CVS even reached out to me to help share the good word on their revamped line of healthy snacks in stores, I had actually taken notice myself. CVS has always been my go-to pharmacy and with its location directly next door to my favorite grocery store, I find myself in there often. Lately, I noticed they stock my absolute favorite Kevita probiotic drink (lemon cayenne ftw!) and as I stood in line one day to pay for it, I realized I was no longer surrounded by checkout candy, chocolate and other typical convenience store garbage but healthy, on-the-go inspired things like jerky, nuts, dried fruit, protein bars and even refrigerated protein options like Greek yogurts. Um, score? Finally, a store that gets it! 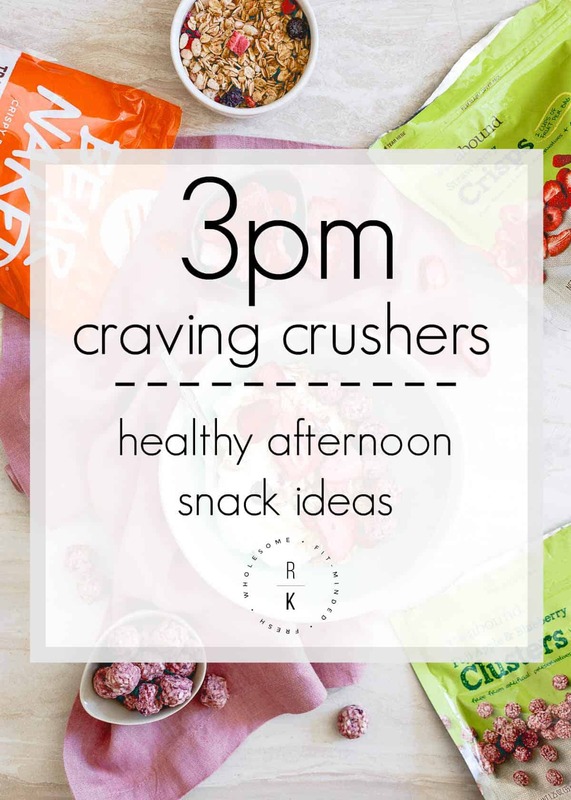 So, I figured I’d share a few 3pm craving crusher healthy afternoon snack ideas with you. All include items you can find this spring at your local CVS store. 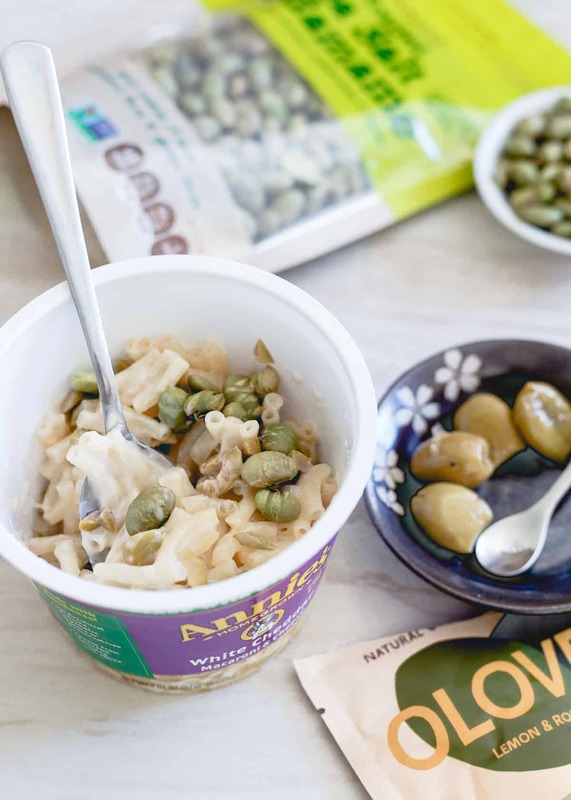 From sweet to savory to protein packed, there are options for every craving! It can be hard to find protein outside of the typical bars and such when you’re on the go which is why I was so excited to see the new refrigerated section in the front of the store carrying grab and go sizes of plain Greek yogurt (plain is always my go-to, I prefer to add my own carb/sugar sources). 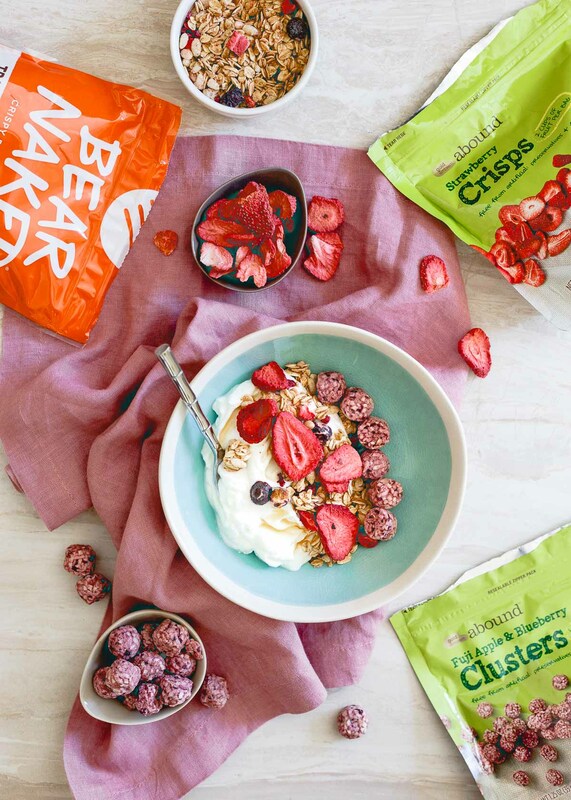 Combined with the awesome variety of freeze dried fruit from Gold Emblem abound™ and some sweet granola, this simple snack will satisfy any sweet craving! We used to be Annie’s mac and cheese obsessed in this house. Who am I kidding actually, we still are considering there’s a BJ’s sized box in our basement for those nights when dinner needs to happen stat! Their portable snack-sized cups make the most perfect savory snack option. I combined it with some lemon rosemary Oloves and sea salt dried edamame for a salty, savory bite. This protein powerhouse snack option might just be my favorite. I love finding new ways to fuel up before or after my workout and all these options are tasty and fun! Those vanilla creme almonds? They’re outrageously delicious. Pretty much dessert in a protein & healthy fat form! And those chocolate covered peanut butter protein bites…also passable for dessert (seriously, I sometimes pop 1 or 2 in my mouth at night when I’m craving something sweet)! Of course, if you don’t want something super sweet, Krave Jerky makes these bars with fruit and quinoa now that are fun too. Mostly savory with a subtle hint of sweetness and majorly flavorful. Any or all of these have a great protein/carb ratio that will power you through or help you recover from your workout. Ummm these are genius. 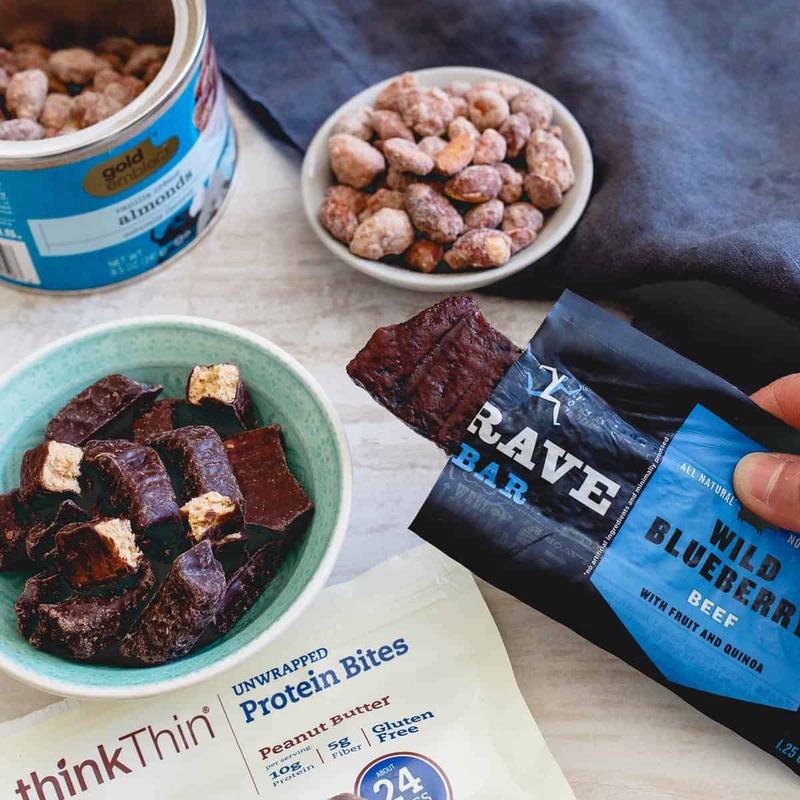 LOVE that you have ideas for sweet, savory (<3 Annie's), and protein (<3 Krave & Think Thin)! Totally brilliant. 3pm is the hangry hour. Like, the struggle is real. love all the variety here! will be stocking up soon at CVS! Great post Gina! Love the selection of healthy snacks at CVS! I am always looking for healthy afternoon snack ideas!! Love that CVS has so many options! I am totally going for the protein powerhouse! I ALWAYS need good snack ideas, so this post is amazing! This post has my name all over it…I get so HANGRY every afternoon around 3pm!! These all sound so good and wholesome! Perfect easy ideas for when cravings hit! I’m totally in love with all of these options! Way better than my solution of cookie dough ??? ?